Today's proliferation of fine kosher restaurants betokens a fusion of tradition and trendy appetites. Many upscale bistros now rival their non-kosher counterparts in quality, diversity, ambiance, and élan. Today's new "kosher restaurant" is light years from the classic deli offering of tongue sandwiches, knish, and matzo ball soup. Ordinary cooks can exploit the flair and flavors afforded by sweeping changes in the kosher industry, both at the supermarket and the restaurant. It is now possible to create gourmet quality meals at home - simply and affordably. Kosher wines are no longer comparable to cough syrup! They are world class, with varietals coming from Chile, Australia, the Golan Heights, California and even Long Island. In many stores, the kosher aisle is a real aisle! Not just a few shelves. And in New York, you'll find kosher markets as big as a conventional grocery store. With kosher foods now a $4 billion a year business, it's never been easier to maintain a kosher kitchen. cooks in creating uncommon meals for holidays, special occasions, and everyday. My audiences have been very enthusiastic, telling me they have found great inspiration to replicate the easy elegance modeled in the books. "We have some great kosher restaurants in our town, but a few times a year, we like to create a fine repast at home and involve the kids in the production of it. My eldest son (12) plays maitre d' while my youngest daughter (8) takes our orders at the table. The two teenage girls have been cooking up a storm in the kitchen, and we already know what's on the menu, but we listen patiently as our waitress daughter rattles off "the specials". My youngest son (9) comes around and fills up water glasses. When all is ready to serve, we "ask" to dine with the chefs and everyone sits down together. When the meal is deliciously over, my husband declares he forgot his wallet and my maitre d' son dispatches the two of us to the kitchen to do the dishes!" an angled set of cuts, or a cross-hatch stacking of vegetables (like string beans interlaced with carrots). If you are cooking with kids, remember that color and texture are as much a part of the process as taste. For children, food is associated with fun, not just nutrition. As we all know, what took hours to prepare may take moments to consume. Involving children in preparing a meal gives them a sense of perspective, proportion, appreciation of resources, and a great feeling of accomplishment. 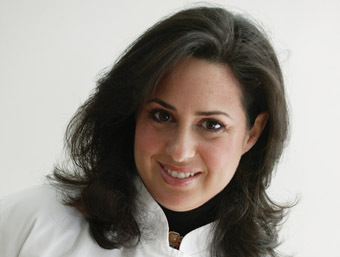 Susie Fishbein is the author of the bestseller cookbook series Kosher by Design (Mar. 2003), Kosher by Design Entertains (Feb. 2005), and Kosher by Design - Kids in the Kitchen (Oct. 2005), published by ArtScroll Mesorah Publications. She holds an MS degree from Brooklyn College and resides in Livingston NJ with her husband and four children.